Can the new kid on the mattress block really compare to a company that with over two decades of mattress expertise? In today’s mattress comparison we’ll be testing just that. It’s Casper vs. Tempurpedic in the ultimate test of quality, price, construction, and transparency. Continue reading to find out who came out on top in our Casper vs. Tempurpedic mattress review. Don’t have time to read the entire review? Skip to the review summary for the quick version. Take $100 off your purchase with our exclusive discount! 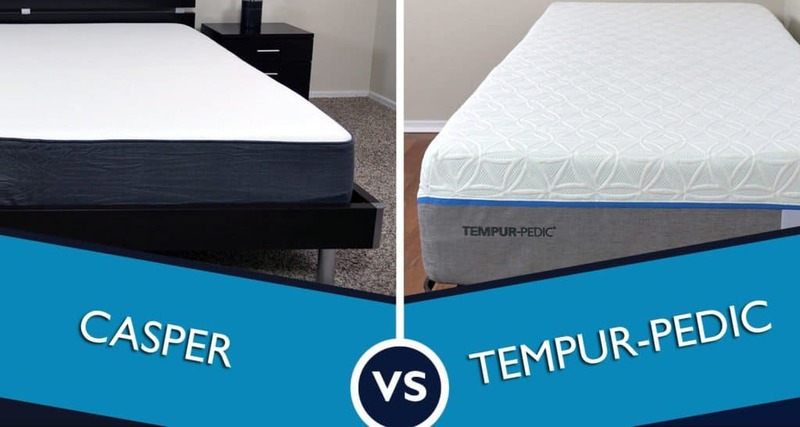 Casper vs. Tempur-pedic – who will win this mattress battle? The Casper is a 9.5″ mattress constructed from 4 layers of foam. Top layer (poly foam) – the top layer is 1.5″ of responsive poly foam. This layer provides a great feel, softness, and good bounce for the mattress. This poly foam does a good job of helping to minimize heat retention by remaining breathable. It’s a highly responsive foam, meaning it changes quickly as you move. Second layer (memory foam) – the middle layer is 1.5″ of memory foam. This layer provides support, pressure relief, and body contouring for the mattress. 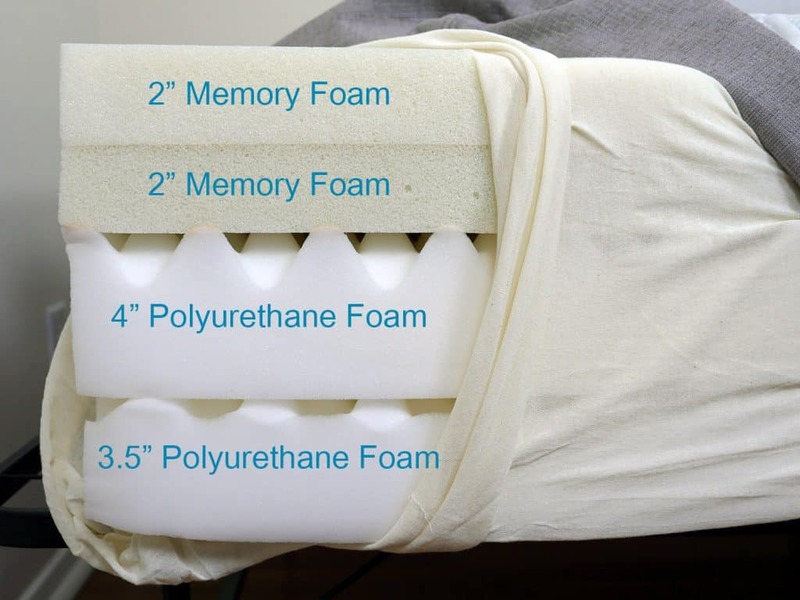 By placing it below the layer of poly foam the heat retention of memory foam is minimized. Any heat that is absorbed by the memory foam will be well below the surface layers, so you won’t feel it. It has a density of 4.0 PCF. Third layer (support foam) – 1.5″ of transition poly foam. This layer works to provide a transition from the comfort layers to the base foam. It has a density of 2.5 PCF. Bottom layer – (support foam) – the bottom layer is a 5″ high density support foam. This layer simply acts a breathable foundational layer for the mattress. It has a density of 5 PCF. Regarding the foam layer densities above, these PCF densities were published on Casper’s website in the past. However, since then they have been removed from where I originally found them and I have not been able to find a reference to them elsewhere on Casper.com. Casper’s cover has a two-tone design, with white on top and grey running along the perimeter. The white fabric on top is soft, is a bit stretchy, and thin. The textiles in the cover are imported from Belgium, but assembled in the USA. The white fabric on top is made from 100% polyester. The side panels are a blend of polyester and polypropylene. The bottom of the Casper mattress is 100% polyester. The memory foam, latex, and heavy-duty poly foam work together to offer sleepers a beautifully balanced feel! Take $100 off your purchase with our exclusive discount by using the code SLEEPOPOLIS or clicking this link! 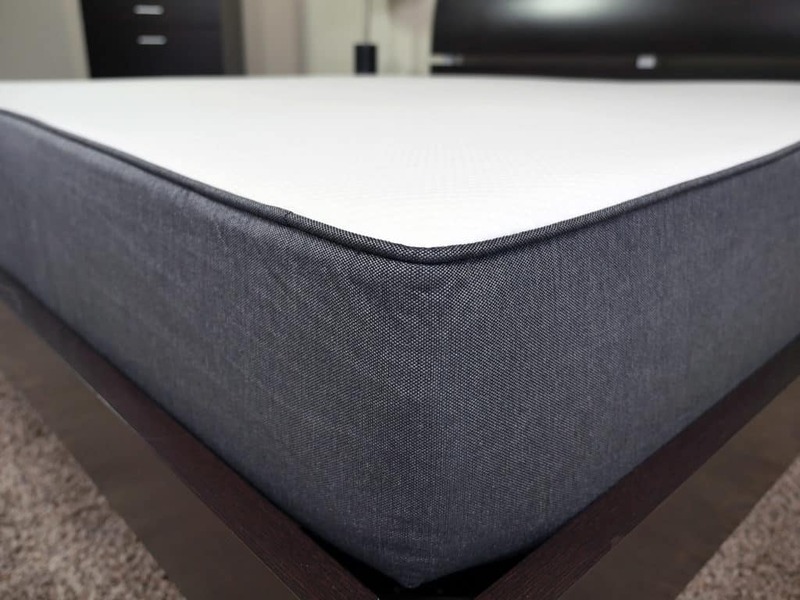 The Casper has a medium firmness and sits about a 6-7 out of 10 on the firmness scale. If you’re a bit on the heavier side (180+ pounds) you may find that the Casper sleeps slightly on the firmer side, up to a 7 out of 10 on the firmness scale. This is due to the increased sinkage and engaging deeper within the memory foam and support foam layers. Casper has a really nice feel and great bounce. Unlike traditional memory foam mattresses that can feel more like sleeping in quick sand, the Casper quickly responds to changes in your movement during the night. You’ll see about 2.5″ of sinkage on the Casper in a normal lying position (note: I am 140 pounds, so increase the sinkage based on your relative size). This gives it a nice moderate hug feeling, without putting you so deep in the foam that you create heat retention issues. Overall, support is pretty good with the Casper provided you are comfortable at a medium firmness. As a comparison, the Casper could be considered a bit of a cross between both the Tempurpedic Cloud Supreme Breeze and Cloud Prima. 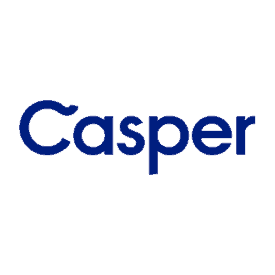 See my full Casper mattress review for full details on this issue. 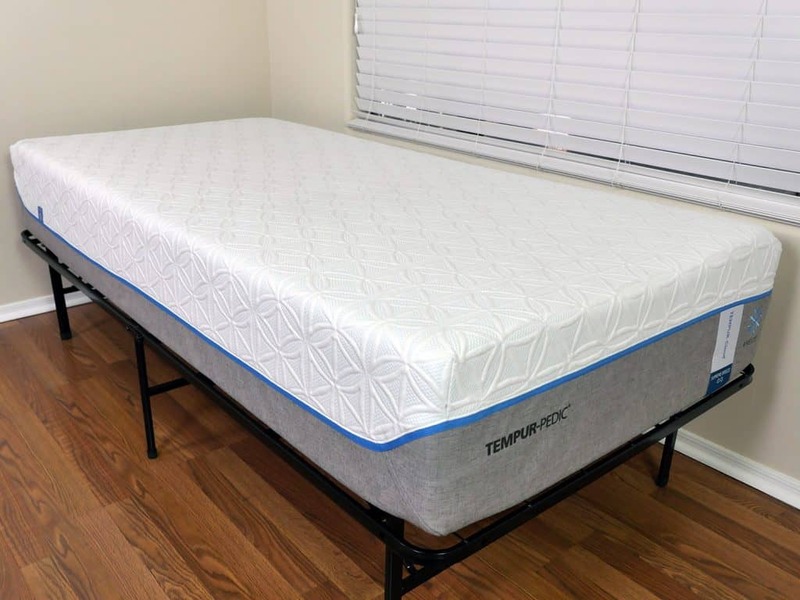 The Tempurpedic Cloud Supreme Breeze is a 11.5″ mattress built from 4 separate layers of foam. Top layer (comfort) – 2″ of visco elastic memory foam. The top layer of this mattress provides the sleeper with the initial soft feel while laying on the mattress. Additionally, this top layer works to contour and hug the sleeper, providing the feel the Tempurpedic line of mattresses are known for. 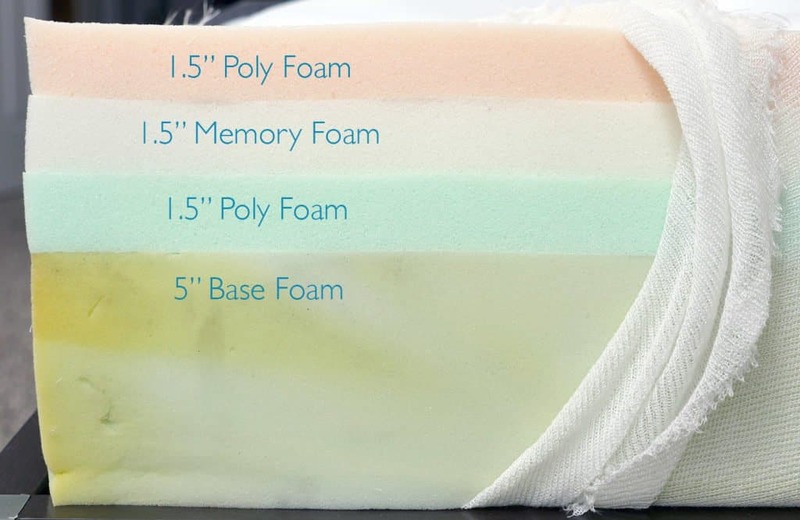 Second layer (comfort & support) – 2″ of vicso elastic memory foam. This layer is similar to the top layer, except it contains a slightly firmer feel. This firmer feel helps provide support and additional comfort for the sleeper. With a firmer feel, the transition from the top comfort layers to the bottom support / foundational layers is much smoother. Third layer (support) – 4″ of polyurethane foam. This layer acts as the main transition layer between the comfort foams and foundational layer. Bottom layer (support & foundation) – 3.5″ of polyurethane foam. As a dense foam, the bottom layer of foam works to provide the deep compression support for the sleeper as well as the base for the mattress. The Tempurpedic has a really sharp design. It has a similar two-tone look to the Casper, but steps it up with angular edging and a blue trim. Built from polyester (94%) and spandex (6%), the cover of this mattress contains a nice degree of softness in addition to a modern yet classic texture. The cover has a classic texture and a great stretchiness. The top piece of fabric is a TEMPUR-Breeze material. It helps to manage temperature regulation throughout the night, working to keep the sleeper cool as they get warm and warm them up if they get too cool. The idea of this material is to maintain a stable body temperature throughout your sleep cycle. The blue trim subtly conceals a zipper that runs along the entire perimeter of the mattress. This allows you to completely unzip and remove the top piece of the cover for easy cleaning. Thick layers of memory foam softly cradle the shoulders and hips, offering great pressure relief for side sleepers! The Tempurpedic Cloud Supreme Breeze mattress is a 5 out of 10 on the firmness scale (where 10 is the most firm). The Cloud Supreme Breeze has a very nice feel. There’s a moderate sinkage of 2″ in a normal lying position (note: I am 140 pounds) as I first lie down on the mattress. After another 30 seconds or so, I felt as if I had sank in another inch or so, bringing me to 3-3.5″ of sinkage on my back. On a positive front, this mattress does mattress create a balanced hug, allowing the lighter areas of my body to sink in as well. This helps in terms of pressure relief as well as the overall bodily contour the mattress provides. Support on this mattress was another area that impressed me for the most part. As a stomach sleeper, I did end up finding the mattress to be slightly too soft. This created a deeper level of sinkage around my hips and lower back, leading to an awkward angle along my spine. Yet, both of us felt that the mattress did an excellent job of supporting us while sleeping on our sides. The pressure relief, contour, and overall support on my side was by far the most comfortable out of the 3 primary sleeping positions. That said, heavier back and stomach sleepers could find this mattress to be a good fit, as they would see a more consistent level of sinkage all throughout their body. Motion transfer was another area where the Tempurpedic stood out to me. Although I was only testing a Twin XL, I was able to gauge the motion transfer by completing my medicine ball test. One 12 pounds medicine ball was placed at the foot of the mattress while I dropped another 12 pound ball at the head of the mattress. After doing so, I was impressed with the Tempurpedic’s ability to absorb the energy that the medicine balls tried to create. Even as I dropped the ball (at the head) from about 4 feet above the mattress, the ball at the other end did not show any signs of movement. Now, keep in mind these are only 12 pound medicine balls. Sleepers of normal weights may cause some movement while sleeping with a partner, but I would expect it to be very minimal. Bounce on the other hand was a little less invigorating. Granted, I did not expect a large amount of bounce due to the memory foam construction, but I would have liked to see more than what the mattress offered. 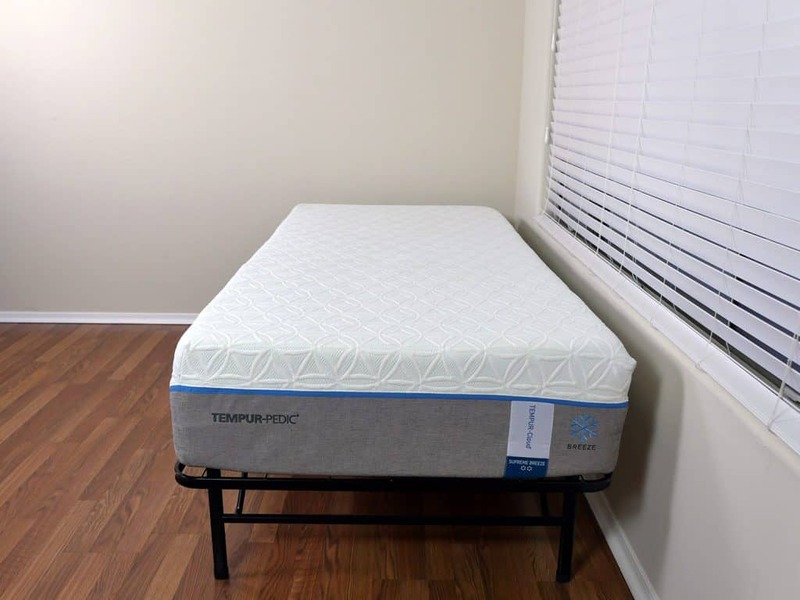 Bounce is a great addition for amorous activities, as well as other daily activities, so receiving no push back from this mattress may come off as a deterrent for some sleepers. Last but not least, cooling. Personally, I did not find the mattress to sleep warm during my tests. Although, I would caution some sleepers to take my results with a grain of salt. Heavier sleepers are going to experience a deeper level of sinkage, resulting in a more pronounced hug. Once this occurs, the TEMPUR-Breeze material may not be as effective. In other words, some sleepers could find that this mattress sleeps warm if they find themselves sinking in deeply. 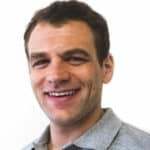 The above shipping, trial, and refunds information is based on US-Mattress.com. These details may vary by different retailers. Read the full Cloud Supreme Breeze mattress review here. Should you buy the Casper or the Tempurpedic mattress? Both of these mattresses have many great positive attributes. Both have been designed to deal with and manage heat retention. Both are targeted at a firmness level that’s ideal for the majority of sleepers. And both use high quality materials. However, I can only pick one. 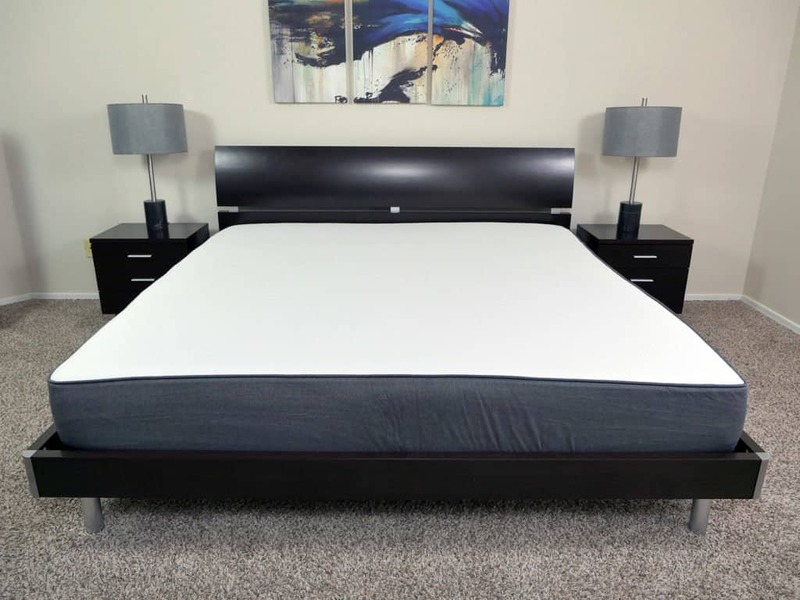 And while I really love the design, feel, and materials of the Tempurpedic, I just don’t think it does enough to separate itself from the Casper to make it worth the price differential. In this contest of old tradition vs. new school, Casper is the victor. Why is Casper the better choice? Transparency – you know exactly what the Casper is constructed from. Each layer’s material and thickness are clearly identified on their website. This level of information is not something Tempurpedic was willing to provide easily. Quite honestly it’s more than a little frustrating to be so blind when trying to research a product and make an informed decision. Casper is very clear what they are / who they are and I appreciate that level of openness. Feel & Comfort – the Casper has good feel, comfort, and adequate support (for most sleepers). It’s a mattress designed to fit the needs of most sleepers. With a 6 out of 10 on the firmness scale I feel like it sits right in the sweet spot of ideal firmness. 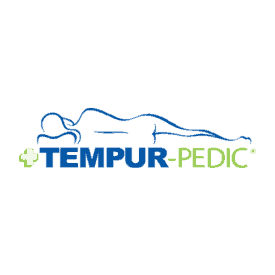 Price – when you get down to the bottom line and make the price comparison, it’s difficult to come up with a compelling reason recommend Tempurpedic over Casper. The Queen Casper is $2,649 cheaper than the Tempurpedic and the King is $3,149 cheaper. At that price you could purchase Casper’s for an entire family for the price of one Tempurpedic. When you combine all of these factors with Casper’s generous refund policy it really is an easy decision. Worst case scenario…if you try the Casper and decide you don’t like it you can simply request a refund and then go try the Tempurpedic. If you find the Casper suits your back and body you just found an amazing mattress and saved yourself over $2.500+. If for whatever reason the Casper isn’t working out, it’s easy enough to make the switch to Tempurpedic. On the other hand, if you try Tempurpedic first and decide you don’t like it you may find yourself stuck with a mattress (even if you exchange it for a different Tempurpedic) that you don’t really love. You’re a fan of the true medium feel – the Cloud Supreme Breeze mattress comes in at a perfect, 5 out of 10 on the firmness scale, where 10 is the most firm. You like the idea of a memory foam mattress – memory foam mattresses are known for their slower response, deeper hug, pronounced contour, and lower level of bounce. You will want to keep these factors in mind if you are thinking about pulling the trigger on this mattress. You have no objection to spending more money – while I think the Tempurpedic is a great mattress, I don’t think it’s worth what you have to pay for it. That said, some sleepers are less worried about price. If money is no object and you want one of the very best memory foam mattresses on the market the Cloud Supreme Breeze is a good choice.